G Protein Coupled Receptors (GPCRs) are the principal family of macromolecular targets of pharmaceutic interest. Among human GPCR about 100 are still orphan and awaiting ligands. The primary aim of this study is to predict new ligands for orphan GPCRs. The second aim is to predict for which GPCR a given ligand is interacting (selectivity profile). In the first step of our procedure, ligand-based, as well as receptor-based fingerprints are constructed. The receptor-fingerprints are based on the physico-chemical properties of residues lining the transmembrane cavities of GPCR homology models [1, 2]. The ligand-fingerprints are derived from Shannon Entropy of pairwise distributions of atom properties. In a second step, the two fingerprints are concatenated into a complex-fingerprint which is flagged with 0 or 1 depending on whether the complex is reported in the MDDR database. In the final step, a learning machine is used to construct a predictive model. See Figure 1. 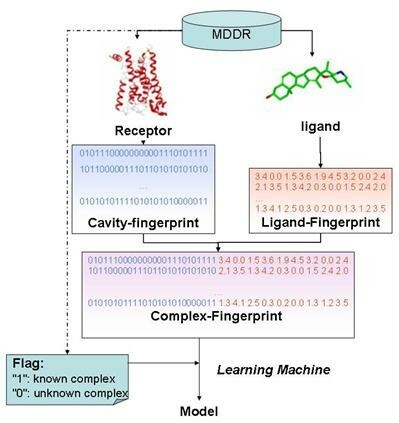 Building a model from the MDDR database using Protein-Ligand Fingerprints. In preliminary studies, we have evaluated different machine learning algorithms implemented in Weka  (Bayesian Network, Neronal Network, decision tree, random Forest, SVM…) in terms of their ability to discriminate between true and false biogenic amine receptor-ligand complexes. Receptor-Ligand fingerprints appeared to be superior to ligand fingerprints in discriminating MDDR activity classes. We are currently investigating the possibility to apply above mentioned strategy to all liganded GPCR clusters to define a global model for predicting ligands of new orphan GPCRs.